This card game is loads of fun! Challenging for both children and adults. 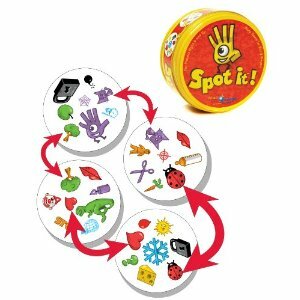 Your babysitter will even love to sit down with your child and play Spot it! There is always one, and only ONE, matching symbol between any 2 cards in this party game. Spot it and you win! A sharp eye and a little bit of speed is all it takes to become a Spot it! master. Speed is definitely the key here. Match them fast! This game is great for perception and matching skills. Typical game play is 10-20 minutes with four different variations: The Tower, The Well, Poison Gift, and Hot Potatoes. Learn how to play The Well below with Spot it!